I’ve been longing for the day I have an entire work space dedicated to making those creative juices flow. Living in a tiny apartment doesn’t really allow for such a place, other than just a desk in a bedroom. 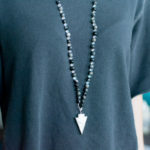 I’m constantly dreaming up a space I can work from and craft DIYs, make clothes, paint, and blog. Having a dedicated work space really helps to keep you organized and on track. Trust me, sitting with your computer on your lap on the couch while watching Netflix is not doing great for your productivity. 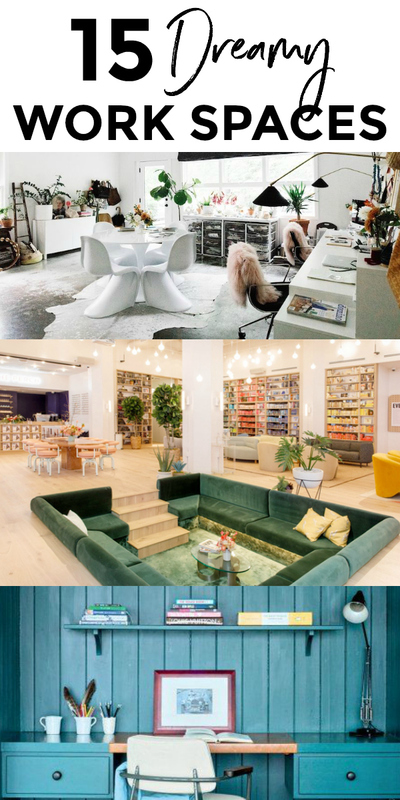 I love getting inspiration and looking at interiors so I decided to put together a list of work spaces I adore and help you get some inspo in return. Here they are! 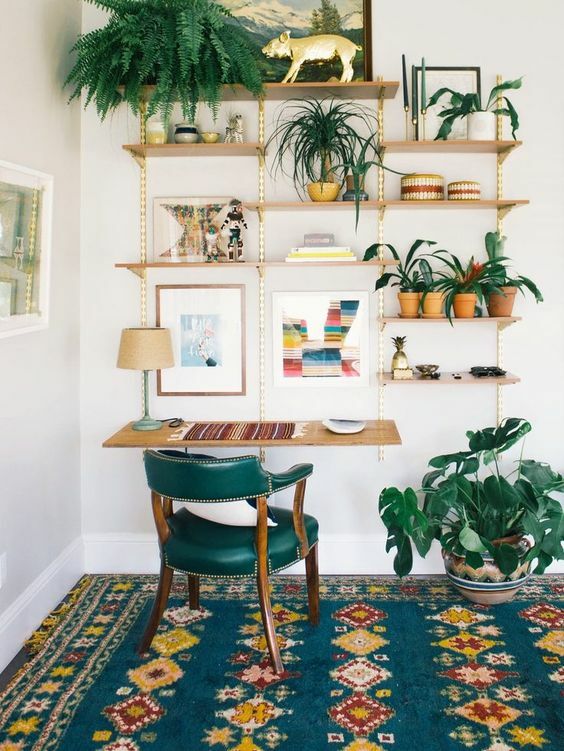 Starting off with my favorite dreamy work space on this list is this boho office with a bunch of plants. 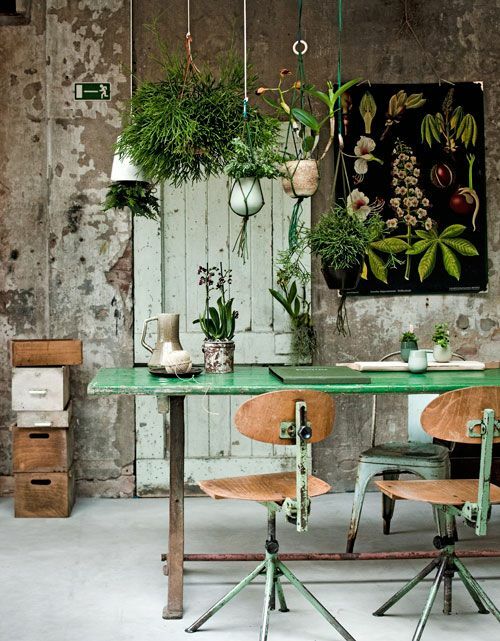 I love the colors, the worn chairs and desk, and the use of greenery to liven up the place. I could get my creative juices flowing here and my productivity working hard. 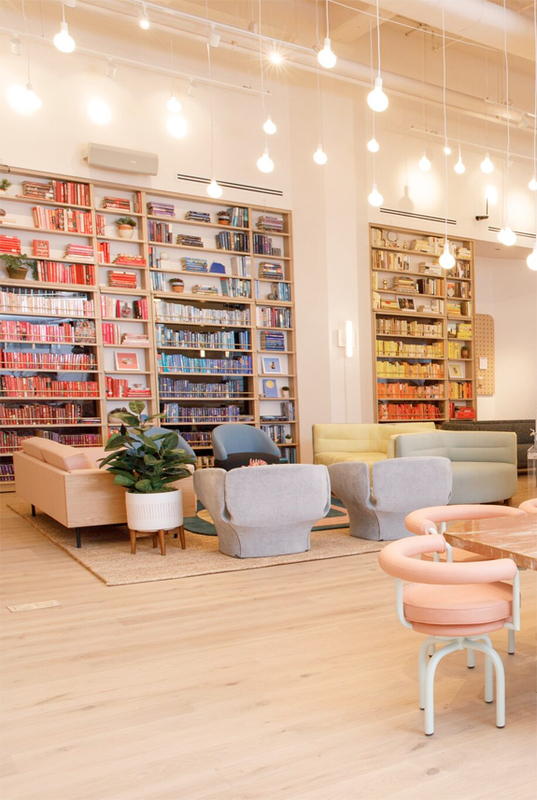 Hellllo work space of my dreams. The only way this space could get any better would be one of those giant bean bag chairs to sit in for comfort. 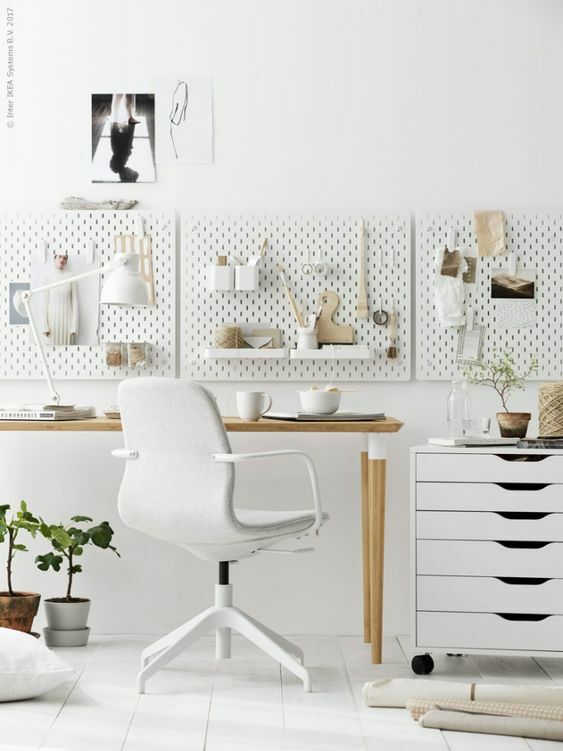 A cool and collected work space. How nice would it be to have TWO workplaces? Plus all those shelves add height that won’t make you feel so closed in and claustrophobic. I think there would be plenty of space in this area. I love the use of baskets and the island desk. How fun would it be to take a break from working and take a swing at the rock wall here? 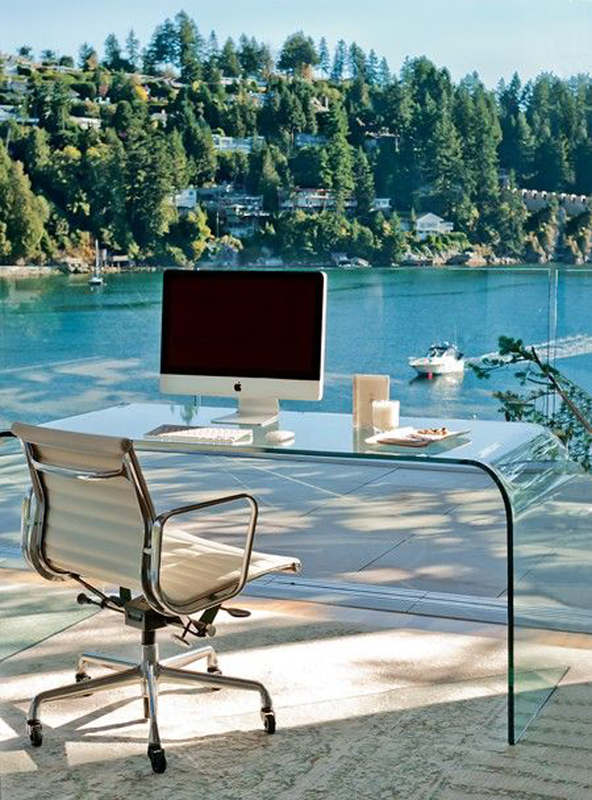 Looks like the perfect work space to me. I love the idea of co-working and interacting with other creatives. 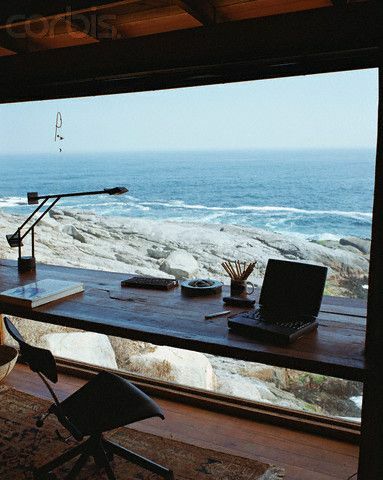 Another super dreamy work space by the ocean. 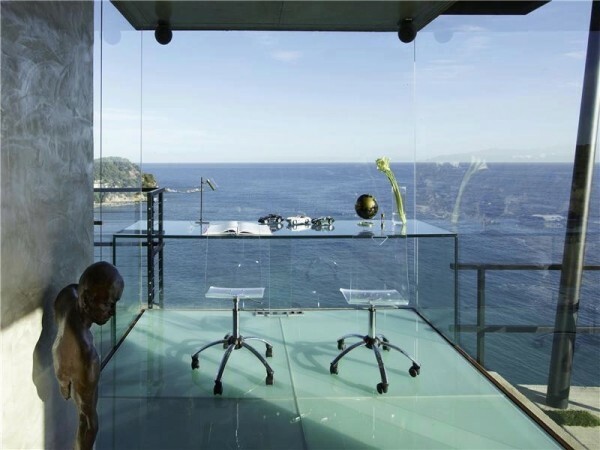 I love the use of acrylic for the chairs and desk, it really highlights that ocean view. My future dream office looks just like this only with a bit more blue. What else could you need? If you haven’t noticed, I have a think for desks with views. I think a view would be bit distracting but would also help with creativity. I love the use of shiplap on these walls and the taped up photos. 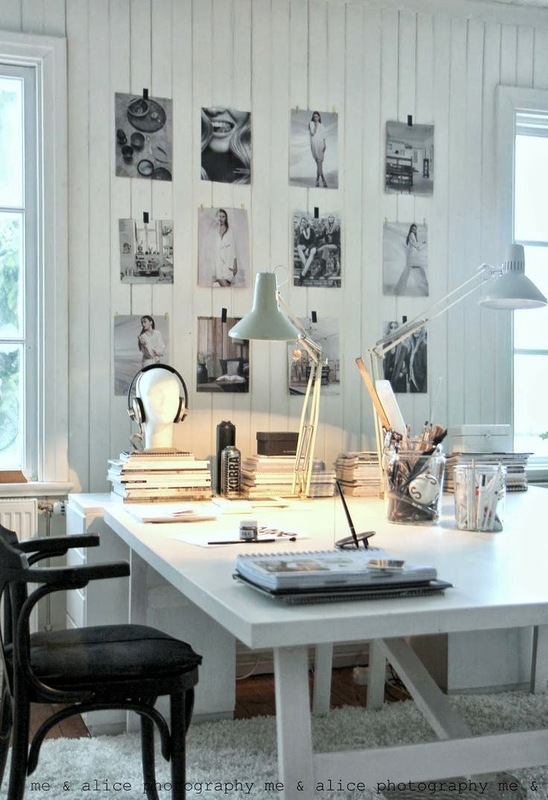 This seems like the perfect photographer’s desk space to sit and edit and get inspo for upcoming shoots. 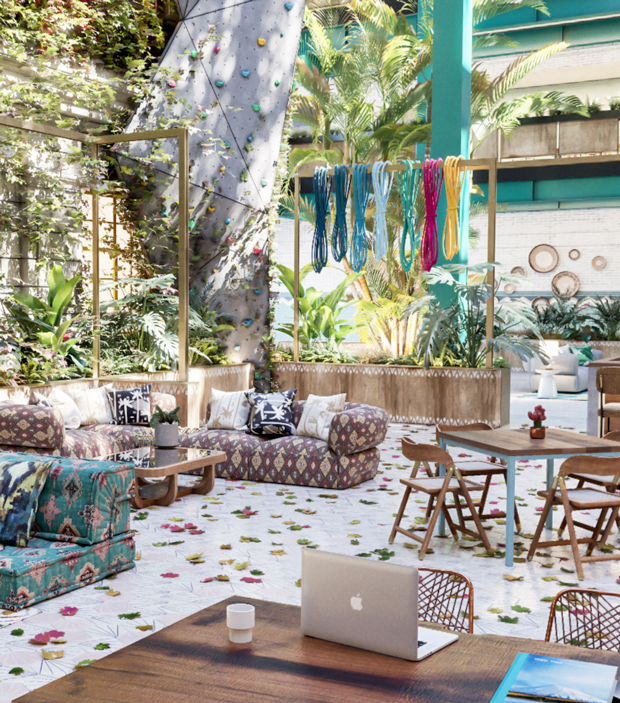 The absolute perfect co-working space goes to The Wing. I’m sure I’m not alone when I say I’d love to work here. Wouldn’t you? Again with the double desks, it makes for the perfect double person work space if you have an assistant or other half you want to share a space with. I also love the pop of color with the chairs here and the lamp. 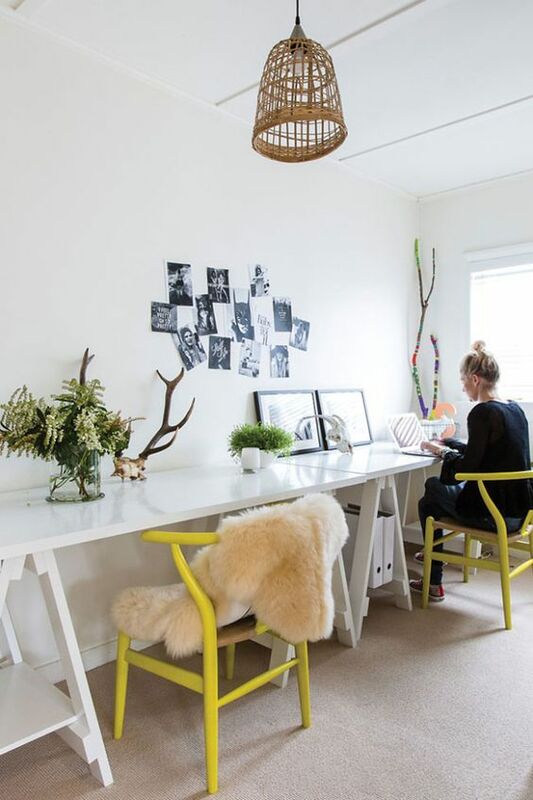 You could easily turn a closet into this space with some paint and a desk. 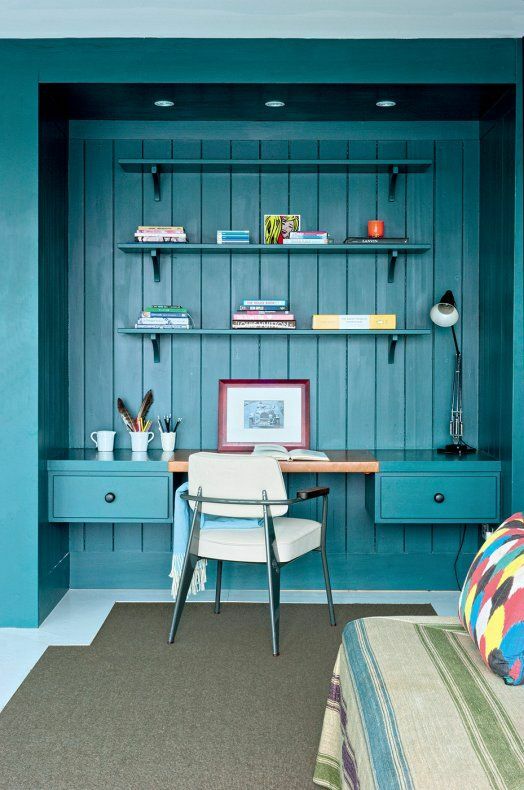 I love the monotone blue, it really makes the work space more appealing and fit in with the room. Pegboards are a crafter’s best friend! It makes organizing so much easier and will help you be more productive since you don’t have to waste time dig around looking for that tape you always misplace. You can visually see all your supplies. I love the use of shelves here. They really do make all the difference. I think it’s about time I added a few shelves to my desk space. 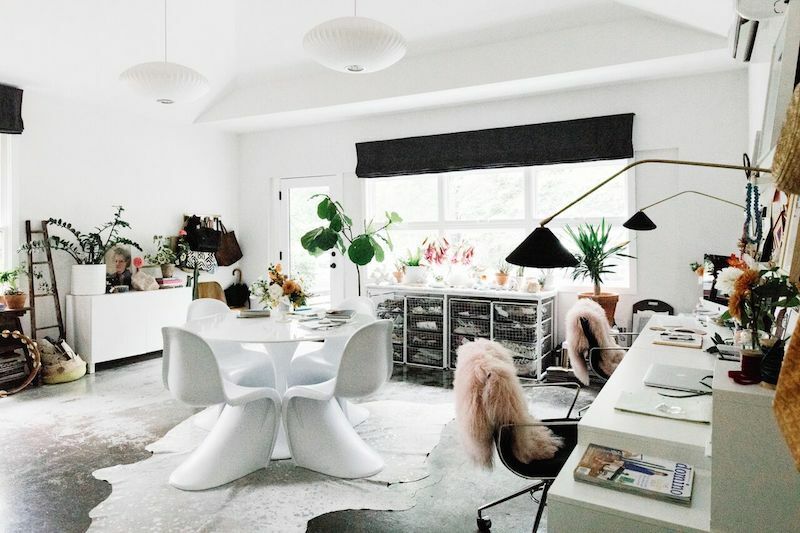 All these dreamy work spaces make me excited for a space of my own one day. Although my space now is only a desk, it’s on my list to have an entire room (or studio) in the future. Looking at inspiration is a good way to refresh and dream, two things that are good for the creative mind. 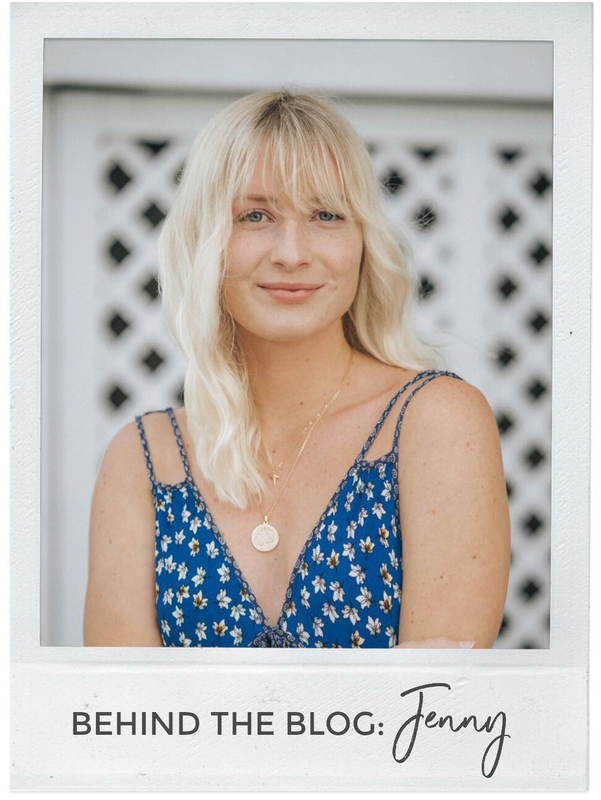 The overall theme I have going on is boho, beachy, full of plants, and a great use of shelving. 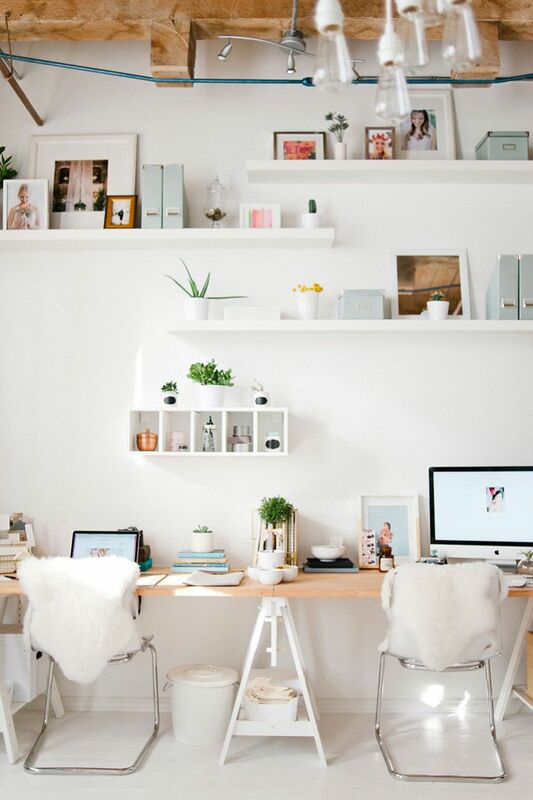 What does your dream work space look like? Does it have a killer view? A centerpiece like an amazing rug or desk? Let me know in the comments!